The BBL, part of the Zetter Hotel, offered the Hoodooist and friends a round after the London Cocktail Week debacle couple of weeks ago (Click HERE for recap) – except this time, service was blameless. Our *new* server was polite and had none of the attitude we dealt with the previous time. So props to that! Remember, it is rare for service to be a constant problem if the bar is willing to remind their staff – but at the end of the day, service wins out on both atmosphere and drinks as the most important quality a bar offers. The BBL, a medium sized bistro with rustic design that falls somewhere between traditional and modern provides a short cocktail list with a classical style. Beginning with the Chamomile Bourbon Sour, it’s exactly what it says on the tin. Luckily not overpowered by the lemon juice as many hurried bartenders tend to go, the chamomile bourbon comes out smoothly, with the subtle floral sweetness of the chamomile, and the red berry sweetness of the bourbon. The Clerk; Armagnac, Pineau des Charantes Vieux, apricot brandy, egg yolk – I was less thrilled about. Dividing egg yolk can be a task, but would probably be advised here, but that’s just up to taste. Strangely, it was the Pineau des Charantes that stood out to me the most, with the Armagnac slithering in soon after. The apricot brandy aftertaste was mild, and pleasant. An interesting aperitif with a digestif texture. Finally, the classic York Club; 12yr Havana Club Selection de Maestros Rum, Lillet Rouge, apricot brandy, bitters – similar to a sweet Manhattan with the choice of Lillet Rouge and apricot brandy, with the vanilla of the rum coming soon after. If there is really anything negative I’d have to say about this experience with the BBL, is that I feel that the prices are a bit ambitious. I can see these drinks charging 9-10.50 pounds, not 10-12. It’s only a pound or so’s difference, so nothing to really complain about, but something I considered. All in all, a relaxed experience – I’m glad they offered to do away with my first impression of their previous employee. On that note. The Zetter Town House (click HERE for review) next door is part of the Zetter family like BBL, and we moved there after our round here, for bit of a shock. 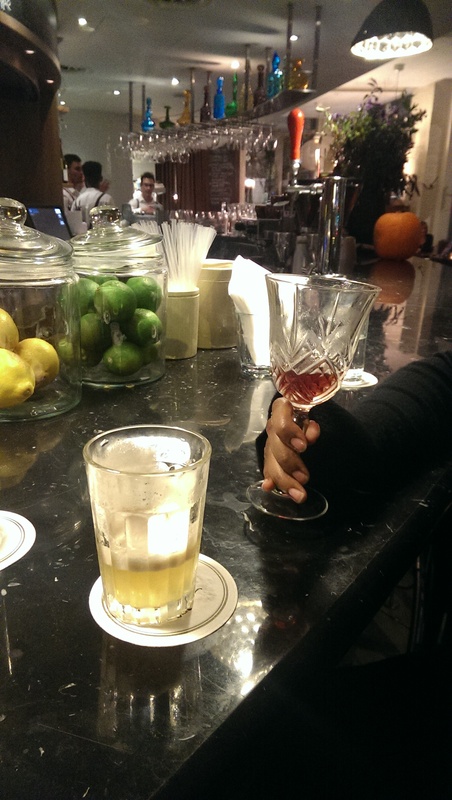 We stopped by for their Halloween offer, the Nosferatini, wet Gin Martini with Iron and sugar. An enjoyable and unsettling drink with the strong iron aftertaste assaulting the back of the palate. But in an attempt to take a twist on the Lord Hinchenbroke’s Fizz, we were faced either with a seriously confused communication snafu, or service issue, depending on how you see it. Said Fizz: Birch liqueur, Antica Formula, Champagne. The transcript of the conversation, with our first, polite server who was wonderful through the night. 5 minutes later, as usual, curiosity won out. So the Hoodooist decided to stop said boss to have the pre-mix thrown into the whisky regardless of the extra charge. A failed attempt to force the Hoodooist into an Antica Formula Manhattan later – a completely different drink from the above idea, one considers the service/drinks balance again. So congratulations to a bar I normally enjoy tarnishing a perfectly good evening. Is it possible this was communication issue instead of stubbornness for the sake of art over customer? Perhaps, but that would say a lot about an individual in the service industry having difficulty in communicating. A logical explanation for your choices suffices much better over attempting to switch drinks around. This was a shame I hardly expected to deal with at a normally enjoyable bar. A bar provides a suitable explanation if they choose to defy the customer, or they’re hardly a bar. “That gin has not been in a freezer, so we can’t use it in our Martinis” is a logical explanation. But if the customer asks for ketchup in their Martini, you put the ketchup in the Martini. Back to the Bistrot Bruno Loubet review, I look forward to stopping by here for a meal, and a great example of redemption – or maybe the BBL and Zetter Townhouse just dressed as each other for Halloween. This entry was posted in Bars & Cocktails, Gastronomy and tagged Bar/Restaurant, Date, Small Groups.